Venus and the moon shine in the night sky June 15, 2018, here shown at 9 p.m. local time in New York. 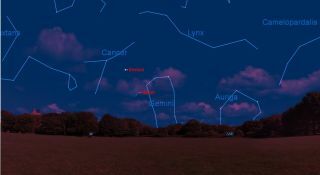 This evening (June 15), the two brightest objects in the night sky will get together and will likely attract a lot of attention, even from those who normally do not spend much time in gazing up at the sky. Of course, neither object is near each other in space; it's all an illusion of perspective. This evening, the moon will be 224,000 miles (360,000 kilometers) from Earth, while Venus will be more than 480 times farther away at 108 million miles (174 million km). And as it gets darker, you might take note of two other objects, much dimmer than Venus, situated well to the lower right of that brilliant planet. Those will be the "Twin Stars," Pollux and Castor, marking the heads of the constellation Gemini, the Twins. But the stars themselves aren't identical twins in the sky — Pollux is noticeably brighter (by a half magnitude) than Castor. Lately, bright Venus has been a skywatching focal point as soon as the sun slips below the horizon. It currently dazzles in the western sky, nearly one-third of the way up from the horizon to the overhead point. As I always do, I've gotten quite a few inquiries about it in recent days. "I was outside walking right after sunset and was sure I saw a UFO almost motionless, hovering in the western part of the sky." Or, "Was there anything unusual going on in the sky during this past week? I keep seeing this steady, bright light hanging over toward the west; is there anything that could explain this 'sighting'?" Some folks are rather surprised when I tell them that Venus has been visible in the evening sky since March. I've had conversations with people who insist that "Venus wasn't there just a week ago!" and that this is the first time that they've caught sight of it. Of course, earlier in the year, Venus was considerably lower in the west-southwest sky, and setting much earlier in the evening (just after 8 o'clock). But now that we're less than a week before the official start of summer, there are more people strolling outdoors, taking in the balmy evening temperatures, and looking up. In addition, the viewing circumstances for Venus have since changed significantly for the better. This resplendent world currently lies well to the north of the celestial equator and especially favors viewers who live at midnorthern latitudes, such as Salt Lake City, Denver, Indianapolis and Philadelphia. And even though they will be rather widely separated on Friday night, the moon and Venus will still make for a "dynamic duo." In fact, right now, Venus is at the pinnacle of its current evening apparition and is setting around 11 p.m. So enjoy!